When it comes time to renovate your kitchen—whether it is your rental investment property or your personal residence—it can be hard to know where to start. Do you rip it all out and start from scratch? Do you simply update pieces of the space or do you do an overhaul of the layout? There are so many things to consider before jumping into the project full-swing. To help you out, we have compiled a list of five tips to help you ease through your next kitchen renovation. If you’re working with a tight budget but feel the need to update your existing kitchen, there is hope. You don’t have to fully scrap the idea of remodeling—it’s just a matter of tweaking the concept. To give a kitchen a quick facelift, swap out cabinet faces and hardware and update the appliances. Adding a press-on tiled backsplash along with the new features will give the kitchen an entirely new appearance with minimal work. If you’re ready to go all in, consider changing up the layout of the kitchen. Just because someone else put it there doesn’t mean you need to keep it there. How is the kitchen going to be utilized? Do you feel like the bar would be better suited in another location or that the sink should really be elsewhere? Go for it. There are a few things to keep in mind when reevaluating the layout, though. You’ll want a “set down” space on either side of the cooking area. You’ll want to keep an area that is open and easy to access for preparation purposes and you’ll want an open space on the side of the sink, as well. Set up a good flow. Consider how you move while cooking and build a layout around that. A good flow in a kitchen is more important than the type of countertop you put in or the color of the tile you select. If you have a large open space in your kitchen, consider putting in an island. These create a space inside of the kitchen that draw attention. They are an area in which you gravitate toward, a gathering place. They also create a circular flow within the kitchen which helps improve functionality of the space. When it comes to the kitchen, flooring is an important decision. When selecting the type of flooring you’ll be using in the room, it is important to keep in mind the function of the space. There is a chance that there will be spills, both liquid and solid, so it is vital to select a floor that can withstand liquid and repel stains while being able to take the impact of things like broken glasses and plates or heavy pots and pans. 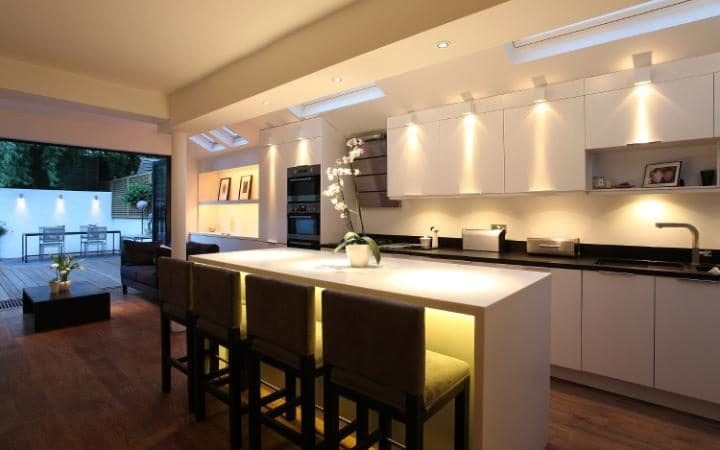 Lighting is vital in a kitchen so whether you are doing a complete overhaul or merely just updating a few features, always verify the lighting works for the space. Select lighting fixtures which enhance the visual appearance of the room while improving the functionality of the space. Avoid having any dark corners which will ultimately become unusable due to visibility. Utilize under-cabinet lighting or staggered levels of lighting to overcome any dark spots in the room. The kitchen is one of the rooms people spend the most amount of time in, both privately and when entertaining. This makes it one of the most important rooms of the home to keep updated and refreshed. Following these few simple tips when considering your renovation project will help keep your task on track and heading in the right direction. Whether you do it yourself or hire a contractor to handle your kitchen remodel for you—a kitchen remodel is an adventure. Have fun with it!